Vassar Department of Music faculty preferences. 2) Whatever style you use, stay consistent with the style you have chosen! 3) A fantastic, compact overview/comparison of each style is presented in this Purdue OWL Citation Style Chart. Whatever style you choose you may want to keep it handy while writing your paper. Michael Pisani: Chicago Manual of Style/Turabian. See his Writing Tips below. 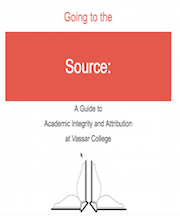 An In-depth discussion of why citation matters and how to avoid plagiarism. Written by the Vassar College Libraries, The Writing Center, and the Faculty.